Is a family floater insurance plan enough to protect your loved ones? As the financial year-end approached, Pratibha – a married working woman with children – began thinking of making an investment that would give her a tax break. While her original plan was to buy health insurance for herself, she began to feel guilty about leaving out her husband Yash and their two children. And what about Yash’s parents, both in their sixties, who are currently living with them? That’s when Sarika introduced Pratibha to the family floater scheme. “It ensures a cover for both of you, and even your children,” she said. While Pratibha was relieved she could protect her children as well, she had a concern: wouldn’t this entail an even bigger premium? The conversation ended, and Pratibha walked away relieved. Her mind was made up: she would get the whole family insured, including her husband’s parents. Clearly, she was convinced that the family floater plan will provide adequate security for her family. 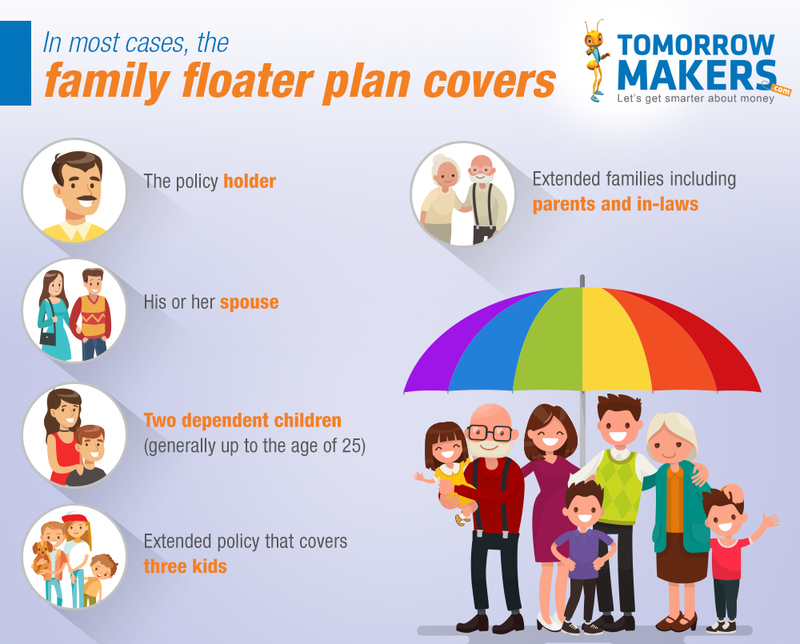 A family floater plan that is designed to bring other family members under its scope of coverage. This is how it works: There is one sum insured which jointly covers all the members named in your policy. If any member makes a claim up to the sum insured in one year, the amount will be reimbursed, and the entire cover is exhausted. However, if a smaller claim is made, the sum will be deducted from the original sum insured, and the balance will become the maximum available cover for the other members. Incidentally, premiums for your father-in-law and mother-in-law cannot be included as tax deductions under Sec 80D. This means that Pratibha will not benefit from bringing Yash’s parents under the policy, from a taxation point of view. However, if Yash were to get the policy in his name, he could claim the deduction benefits under Sec 80D for including his parents in the plan. Other relatives can likewise be covered by health insurance – both individual and family floater – though the premium paid for them entails no tax benefit. This list includes your siblings (both brothers and sisters), uncles and aunts, grandparents and nephews, nieces and cousins, or any other relatives. A family floater is the best available insurance option when your primary aim is to secure the health of your whole family. It also spares you the hassle and confusion of maintaining individual health insurance policies for each family member. Moreover, it is more affordable than individual plans. It is also particularly suitable for young families where members have low health risks or even if they are covered by group insurance offered by their employer. A major benefit of the family floater plan is that you can get a higher claim amount if you make only one claim a year, as compared to the claim amount you may get from an individual medical plan. And this brings us to our original question: when it comes to protecting your loved ones, is a family floater plan enough? The answer is: no, it isn’t. It may be an ideal option, but it may not be enough. Let’s assume there is one mishap after another – after all, no one can know a second mishap will follow the first – then the claim of the first could eat into that of the second, leaving your family to make up the deficit from internal resources. In that respect, a family floater plan is not enough. An individual policy, albeit with a higher premium, could serve your family’s needs more satisfactorily. The second disadvantage is the Floater premium is calculated on the oldest family member’s age. Thus, if you include your elderly parents or parents-in-law in the plan, it will mean an outgo of a considerably higher premium. This is one of the main reasons why people are reluctant to include their parents in the family cover. Third, older adults (read: your parents) may be asked to undergo health check-ups before the policy is accepted; there is always a chance that your application for a family floater plan could be rejected based on a pre-existing ailment, or even their current level of health. Due to these reasons, potential policyholders are often advised to get two separate floater plans – one for you, your spouse and children if any; and the other for your elderly parents. Health insurance is not an investment – the premium you pay gives you a much-needed health cover. That it also offers tax benefits is incidental. It is best not to look at a family floater plan only to maximise tax benefits. As financial planners often say, before investing get the health security in place. Disclaimer: This article is intended for general information purposes only and should not be construed as insurance, tax or legal advice. You should separately obtain independent advice when making decisions in these areas.